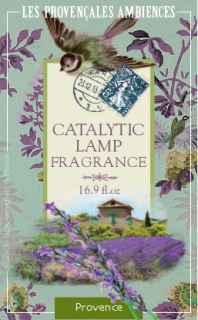 Les Provencales Ambiences catalytic lamps are beautiful pieces to decorate and fragrance your home. 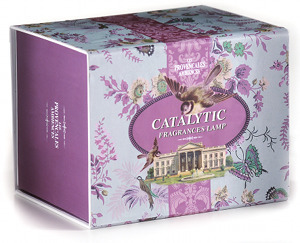 The catalytic properties also cleanse and purify the air in your home. The scented oils are therapeutic stress relievers and romantic enhancers. Each lamp comes in a box with all necessary accessories to pour the oil in the lamp. You may choose your lamp and your fragrance. 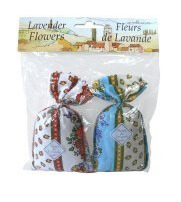 The set will also include a sachet of Lavender. ALOE VERA - Fresh Green florals with crisp aloe accord and clear musk. ANJOU - Great apple fragrance. BAMBOO - Fragrance with lime, cardamom, green tea, bamboo leaves, water lily and vetvier. 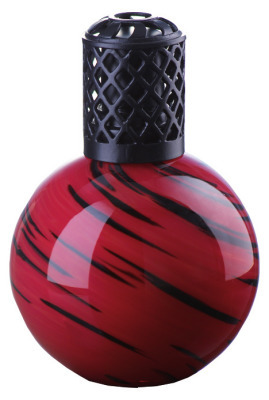 BOIS SANTAL - A harmonius blend of sandalwood and vetvier enhanced by warm spices. BORA BORA - Zesty Bergamot, Lime and Grapefruit with coconut and tropical floral petals. CLEMENTINE - A burst of clementine, orange, grapefruit and mandarin leaves with musk and vanilla. FRENCH BREAKFAST - A delicious French pastry with butter and rum soaked raisins. FRENCH QUARTER - A Herbacious bouquet with floral notes and a warm woody base. FOREVER AMBER - An amber complex with frankincense, patchouli and sweet vanilla. GARDEN OF EDEN - Pink Lotus, White Orchid, Blue Oris Lily and Jasmine combined with Amber and Vanilla. HONEYDEW MELON - Light sweet and juicy, just like a honeydew melon! PACIFIC PARADISE - Crisp clean wind of the Pacific with aquatic nuances. PINA COLADA - Sweet tropical coconut and pineapple. 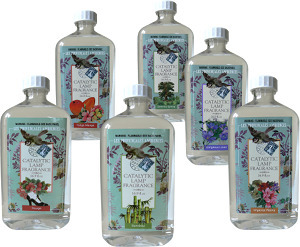 PROVENCE - Classic scents of the fragrant fields of France. RED CURRANT - Red currant. TANGO MANGO - Ripe mango mixed with exotic cinnamon. TEA PARLOR - Fresh and Soothing aroma of green tea and bergamot. VANILLE BOURBON - Rich aroma of Vanilla. *ANTI SMOKE - was specially designed to combat tobacco smoke. It has a flavor of citrus and pine blended with tobacco spices. Since you will pick up these lamps and oils from our headquarters location, they are available on a first come - first served basis. These lamps and oils are not permitted to be shipped to California in accordance with the CARB - The California Air Resources Board - the "clean air agency" of California.